~ Heat up your saucepan in medium-high heat. Place butter and let it melt, add in your onions and cook till they have that golden brown edges. Drop in your cubes of frozen spinach, lower your heat to medium and gently separate the spinach cubes. ~ Sprinkle some grounded pepper to the sautéed filling, cook until the mixture has no visible liquid. Place your finished sautéed filling in a small bowl to completely cool down. ~ Crumble your feta and prepare your flat tray/grill plate for your Turkish bread. It’s up to you if you want to line it with aluminium foil for easy cleaning. ~ As I bought a large long Turkish Bread, I’ve cut it in half before slicing its one side for the fillings. Flip the bread so that the underside is face up and brush it with your avocado or olive oil. ~ Heat your griller around medium/high. Place the bread under the griller and toast till golden brown. Watch it, as it will toast quickly and you don’t want it burnt. ~ Take the flat tray out of the griller, flip the Turkish breads topside up and divide the spinach and feta, spread it equally inside each bread. ~ Put generous amount of shredded mozzarella on each bread. Give each bread a good drizzle of your Avocado or Olive Oil and brush some on top. Place the tray under the griller to finally toast the top and slightly melt the cheese. ~ Like the underside, please do watch your Turkish Bread carefully while in the final stage as it will toast quickly under the griller. ~ Once the top achieved that delicious golden toasty brown colour, remove under the grill quickly and cut the breads into individual portions. Serve immediately as this Toasted Turkish Bread is so wonderful to eat while piping hot! BEST WITH: Your favourite hot beverage or ice cold drinks. You can use any kind of bread, even sliced bread and use a portable grill press or oven toaster. If you are going to use fresh spinach instead of the frozen type, (cooking stage) once the leaves becomes limp, soft and have that bright green colour, remove and drain it on a metal sieve. Gently press the filling with the back of a spoon against the sieve to remove excess liquid. To make Garlic Infused Olive Oil, just crushed a large clove of garlic with the flat side of your knife (don’t use a garlic crusher tool) and soak it in 1/4 cup of Olive Oil. Leave the crushed garlic soaking for good 10-15 minutes before using the Olive Oil. Don’t add additional salt as the Feta is already salty. I love healthy food! Thanks for sharing this recipe. I'm your new follower. Please check out my blog when you have time. mmm.. So easy but so Yummy! I love it!! I'll put a lot of cheese on it.. mmm.. Thanks! 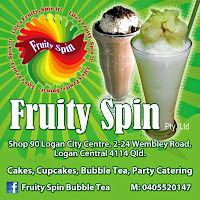 Am based in Brisbane, and the ingredients are available to buy in Woolworths or Coles (our normal grocery stores).